We are highlighting the scale of the endoscopy crisis in England with statistics published today that reveal on average a third of hospitals every month this year were in breach of the waiting time standard for endoscopy tests that could diagnose bowel cancer. 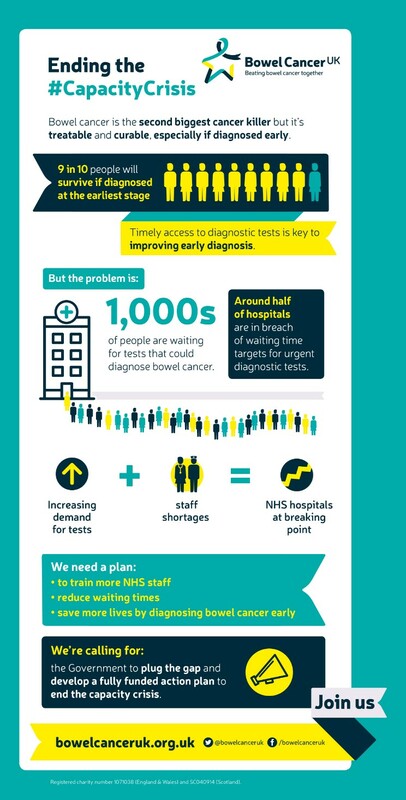 The waiting times published by NHS England today (Thursday 13 September) is further evidence that demand for diagnostic tests is outstripping capacity. For the first six months of 2018, approximately 3,000 patients (2,970) with suspected cancer waited longer than two weeks for an urgent referral and more than 1,700 waited longer than six weeks for routine tests. Many NHS hospitals are at breaking point because they simply do not have the capacity to meet growing demand. A lack of funding, limited resources and a shortage of staff to carry out procedures are contributing to this. NHS hospitals are now taking costly measures to deal with the lack of endoscopy capacity. A quarter of hospitals commission private providers to help clear their backlog of patients waiting for an endoscopy test, as well as introducing expensive over time working hours in the evenings and weekends to cope with demand. The charity is also concerned that variations in quality and safety exist amongst endoscopy units in England as not all NHS or private providers are accredited by the Joint Advisory for Gastrointestinal Endoscopy (JAG), the formal recognition of high quality standards for endoscopy in the UK. The charity is seriously concerned that the lack of sufficient workforce will put more pressure on an already over stretched service. In 2017 the Government committed to recruit and train 400 non-medical endoscopists to carry out an additional 450,000 endoscopies every year by 2021 to help plug the gap. However, as of May 2018 only 130 non-medical endoscopists have completed the six month training programme. The Government’s ability to recruit and retain sufficient workforce to meet endoscopy demand is the biggest risk to achieving a sustainable service. In November 2017, NHS England confirmed plans to introduce a new bowel cancer screening test Faecal Immunochemical Test (FIT), which is more accurate, easier to use and has proven to increase uptake. The new test was due to be rolled out in April this year but has been delayed and now a phased roll out will start at the end of this year. In addition, the Government accepted recommendations to lower the screening age from 60 years old to 50, meaning an extra 7.5 million people will be eligible for screening. The charity is seriously concerned that the lack of sufficient workforce will put more pressure on an already over stretched service. Addressing workforce issues must happen now. Ahead of the spending review in November, Bowel Cancer UK is calling on Chancellor of the Exchequer, The Rt Hon Philip Hammond, and the Secretary of State for Health and Social Care, The Rt Hon Matt Hancock, to work together on a fully funded endoscopy action plan to tackle staff shortages in diagnostic services for bowel cancer. Addressing workforce issues must happen now. With the new NHS’ 10 Year Plan expected to be published later this year, and the £20bn NHS funding announcement, now is the time to ensure challenges to workforce are prioritised. Deborah Alsina MBE, Chief Executive of Bowel Cancer UK, says: “We cannot continue to paper over the cracks with short-term initiatives. 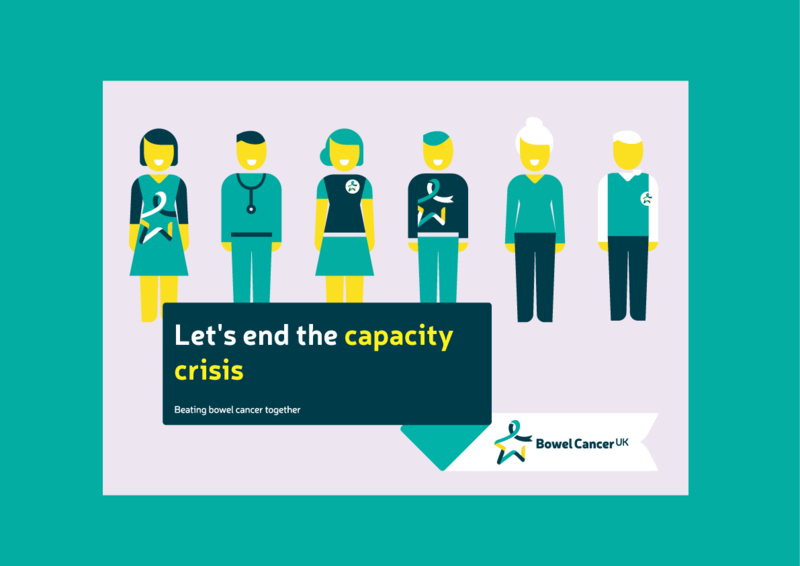 We need a long-term solution to end the capacity crisis in diagnostic services for bowel cancer. This is the single biggest barrier stopping us from either preventing or detecting bowel cancer early so more lives can be saved. With the NHS currently developing a longer term 10 Year Plan and the Autumn Budget imminent announcement, it is therefore critical that we act now to address this vital issue.